The antibody detects endogenous levels of total PAPSS1 protein. Three-prime-phosphoadenosine 5-prime-phosphosulfate (PAPS) is the sulfate donor cosubstrate for all sulfotransferase (SULT) enzymes (Xu et al., 2000 [PubMed 10679223]). SULTs catalyze the sulfate conjugation of many endogenous and exogenous compounds, including drugs and other xenobiotics. In humans, PAPS is synthesized from adenosine 5-prime triphosphate (ATP) and inorganic sulfate by 2 isoforms, PAPSS1 and PAPSS2. 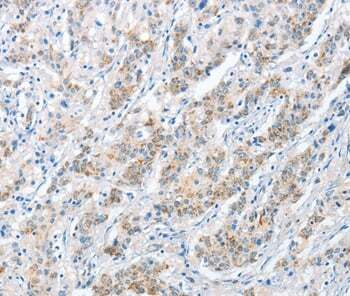 Immunohistochemical analysis of paraffin-embedded Human cervical cancer tissue using at dilution 1/40. 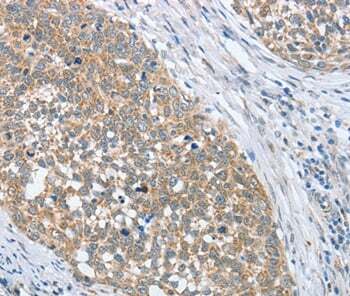 Immunohistochemical analysis of paraffin-embedded Human gastric cancer tissue using at dilution 1/40. 1. leptin signalling links a novel SFK/ERK1/2-mediated pathway and SK1 expression.